Check out our new FREE App in the App Store. Search for Kaufman Financial. Like us on our Facebook page and stay up to date with things going on at Kaufman Financial. 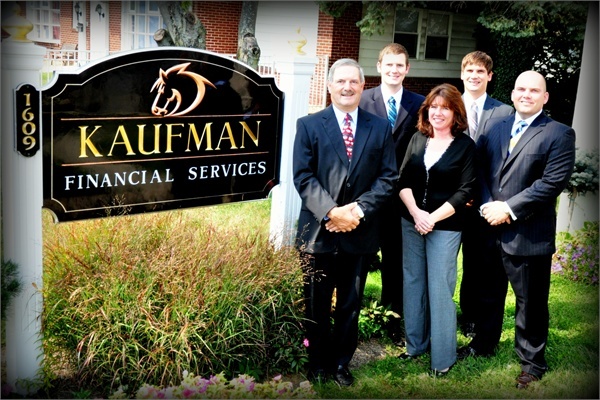 What can Kaufman Financial Services do for you? Individuals face challenges every day. Can you tackle your financial challenges all on your own? Located in Reading, Pennsylvania, our knowledgeable staff, including four financial advisors, can help you develop a plan to address your financial goals and objectives. Providing superior client service and information is the core of what we do at Kaufman Financial Services. With financial planning becoming a major part of the American lifestyle, we strive to be the best so that you, your wallet, and your net worth can see the difference. As an independently owned financial planning firm, we are not forced to offer only certain services. Our independence allows us to offer a full universe of financial services, specifically picking from a wealth of services to individually suit your needs. So if you’re looking for a group of hard-working, competent, and ethical financial advisors to help you with your finances, your search has ended.